Look how sparse it is. It's difficult to believe this is the city of Burbank. I can’t help but notice the absence of high rise buildings in this 1956 view of the San Fernando Valley. There are many buildings yet to be constructed. Of course, there will good deal of new construction on the studio lot as well. 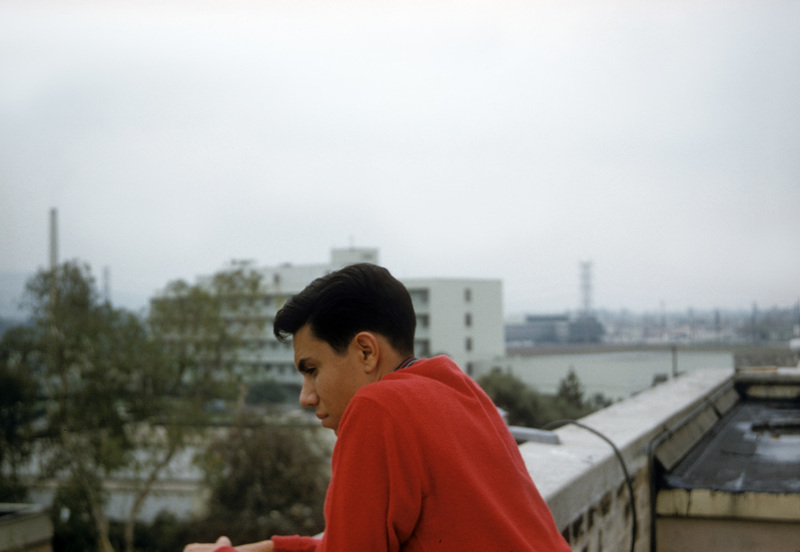 This is my pal, Rick Gonzales on the roof of the Animation Building on the Disney studio lot. We thought we would venture out onto the roof for a special view of Burbank. Of course, this is Burbank of the nineteen fifties, and that's a long time ago. Alright! The view wasn’t the only reason we’re on the roof top of the Animation Building. You’ve probably heard of the famous Disney “Penthouse Club,” right? It was sort of a members only gentlemen’s club located upstairs above the third floor. This private club offered a number of services hard working animators, producers and directors might avail themselves. What did you expect? I guess you thought animators were only into little fairies and bunny rabbits, right? Anyway, there was a fully stocked bar in the Penthouse Club and the walls were adorned with wonderful artwork. The “female lovelies” were the work of the Disney artist, Freddy Moore. The only way to enjoy this special Disney art was to be a member - or in our case - sneak upstairs. To the best of my knowledge, no one ever preserved the wonderful Fred Moore artwork and when later renovation brought an end to the Penthouse Club, Freddy’s murals were lost forever. However, I've heard a few photographs of the mural survives even today. Should you gain entrance to the Animation Building's rooftop (which is doubtful today) I can assure you the view will be completely different. June 4, 2013 by Floyd Norman.